Just a friendly reminder for those that live in Daylight Saving Time areas (that’s most of you in the United States). With the time change, it’s possible that your evening commute just got plunged into darkness or twilight. Remember to be seen! September 23rd marks the beginning of fall this year. Labor Day weekend is the last hurrah for many cyclists in the US. Here in the Kansas City area, all the big charity rides are over with, and all the big bicycle club rides happened back in August. For many, this is the transition to “indoor training” season. Chains are cleaned. Tires are deflated just a bit. Those hooks screwed into the basement rafters or that out-of-the-way corner of the apartment becomes an increasingly frequent home for the bike. Perhaps it’s because I started bike commuting in September 2006, but I have a certain fondness for bicycling through autumn. After a summer of blistering heat indexes and humidity that’s thick enough to swim through, I welcome the crisp, cool mornings and the mild evenings with the sun at my back. Now is the perfect time to get started with layering your clothes. You might find that a pair of knee warmers, a headband, some light gloves and a windbreaker are the perfect solution to chilly mornings. Leave them packed away for the warmer evening trips. If you get good at layering, riding in below-freezing weather becomes easy. Days are getting shorter, so be sure to keep your lights charged or carry a backup. Be seen with high-visibility clothing. Mind the location of the sun. If you find yourself riding directly into the rising or setting sun, you’ll be very hard to spot in the lane as squinting motorists try to deal with the blinding glare. Try riding earlier or later, or pick another route with more shade, a slightly different heading or less traffic. It’s that time of year again. Folks at the office have started questioning my sanity even more than usual. The questions are rolling in. Isn’t it cold? What do you do when it gets below freezing? What do you do when it starts snowing? Do you even have a car? Yes, I have a car, and there may be a few days this winter I use it since I don’t have the option of public transportation like I did at my last job. It takes more than just cold air to make me ditch the bike. I’m also having discussions with my fellow winter cyclists, some of which are giving this a shot for the first time. Some people have pointed to Civia Cycles’ guide to all-weather clothing but I think it’s a bit more complicated than that. For a 40ºF (4ºC) bike ride, I’ve seen Californians wearing stuff that would make me spontaneously combust unless it was well below zero. Doug‘s usual winter wear is lighter than most people I know. For this reason, I suggest finding out what works best for you. Keep a log of weather conditions and temperatures as the winter wears on. Note what you wore and if there’s anything you’d change about your choices. This especially helps you get into the cold-weather groove next winter. When normal skiing gloves fail to keep your hands warm, you can try expensive lobster-claw gloves, but if you can safely operate your brakes and shifters with plain old mittens on, they will keep your fingers all together, nice and warm. They’re also really cheap at pretty much any discount store. Warren taught me this trick. Use parts of plastic grocery sacks on your feet (inside the shoe or between layers of socks) to block the wind and trap heat into your feet. I only do this in the coldest part of the season, or my feet get soaked in sweat. It works that well! Dress in layers, but always make sure the layer closest to you will wick moisture away. This could be wool or a high-tech synthetic base layer. Balaclava-style ski masks provide whole-head warmth, but you may have better luck with a scarf or neck gaiter and a headband to keep your neck and ears warm if you find your head sweating too much. Don’t over-dress, and slow down if you’re getting too hot. If you sweat too much or you have to stop while you’re overheating, you can quickly succumb to hypothermia. Post your cold-weather tricks in the comments. Let’s hear ’em! The past few weeks have been absolutely crazy for me. Lots of really early-morning commutes, some late days at the office. 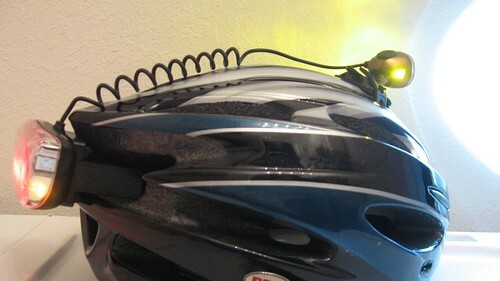 Combined with the shorter days, I’ve had some of the best testing conditions imaginable for a helmet-mounted lighting system that was purpose-built for bike commuters! Let’s take a look at the gear. 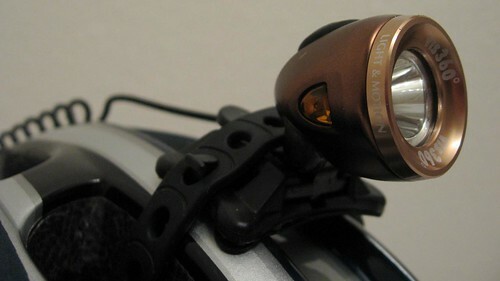 The rear part houses the battery, two amber side-facing LEDs, three bright red rear LEDs with a combined output that matches some of the most popular rear blinkies on the market, and a generous-sized swath of engineering-grade prismatic reflective material, all inside a water-resistant case. A rubber flap covers the Micro-USB charging port. There’s also a small window on the under-side of the unit that displays a multi-color LED which functions as a battery gauge and charging indicator. I was able to fully charge the Vis 360º in about 5 hours, meaning that a full recharge at home or in the office is easily achievable. The rear part of the Vis 360º snaps onto a plastic base that attaches to the helmet with velcro. I found that getting this part mounted securely was somewhat difficult on all of my helmets. This was the most frustrating part of getting the Vis 360º installed. I eventually found a position that worked well enough with a little bit of tinkering. 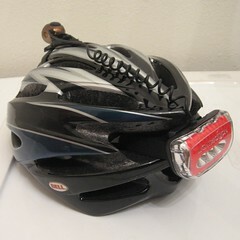 The headlight snaps into a plastic base that attaches to the helmet with a notched rubber strap. This part was easy to mount on several different helmets. The ability to remove the lighting hardware from the helmet while leaving the mounting hardware attached is a nice touch. The headlight itself features one bright white LED and two amber pieces to scatter light to the side with a rubber-covered power button on the top, all packed into a small, light and attractive metal shell. 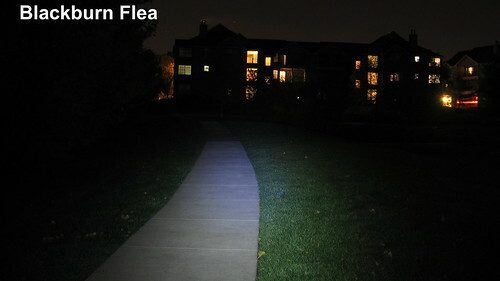 The light has three modes: Full power, half power and flashing. The front LED flashes quite rapidly. The rear LEDs always flash twice per second (250ms on, 250ms off) regardless which mode the front light is in. You must hold the power switch for two seconds to shut the unit off. The whole package looks a bit bulky on the helmet, but it’s surprisingly light at 130 grams. I notice the extra weight on my helmet, but it’s not unwieldy or uncomfortable. 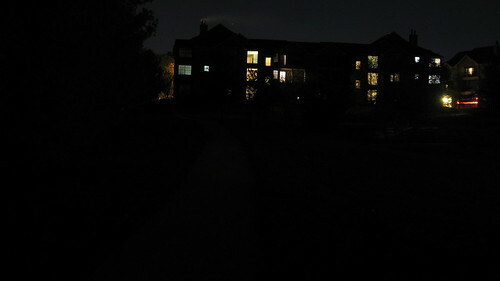 A very dark section of walking trail around the community pond where I live. 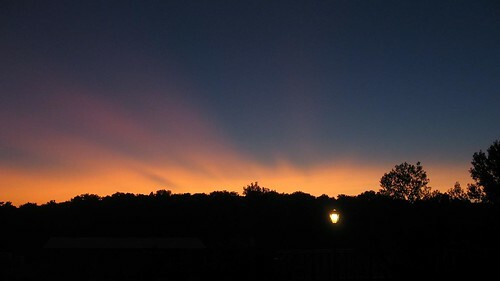 All photos were taken using the exact same exposure settings on my digital camera. 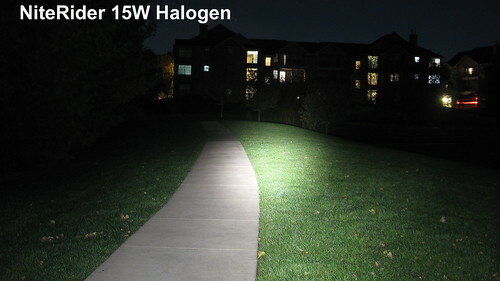 NiteRider Evolution Halogen (Upgraded to 15W). 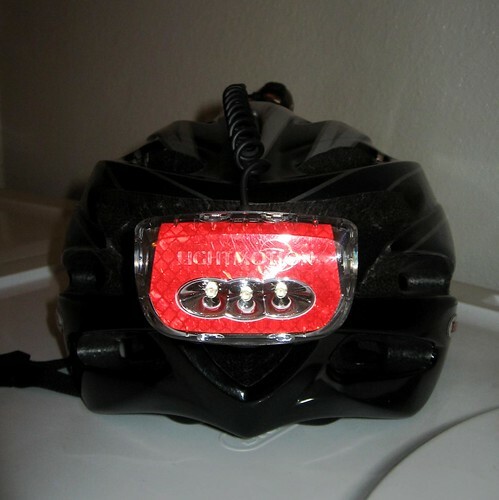 This was my first serious commuting light, and it features a bulky NiMH battery pack that can be strapped to the bike’s frame. The OEM bulb was 10 Watts, and when it burned out, my LBS only had the 5W and 15W bulbs in stock. 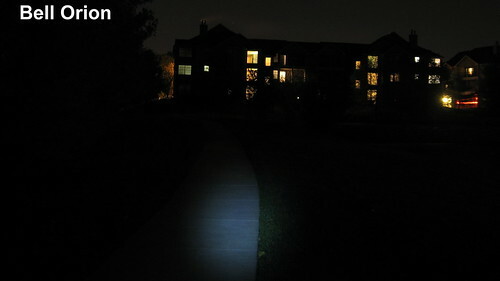 With the 15W bulb shown here, this system runs for about an hour. 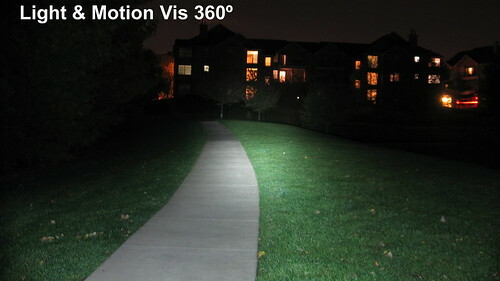 As you can see, it provides a very high intensity spot without much side visibility. This model isn’t made anymore, but you can expect to pay between $100 and $200 for a quality halogen system. On normal mornings when I leave as the sun is peeking over the horizon, I used the Vis 360º in flashing mode. A whole week of commuting (about 6 hours on the road) without a recharge didn’t even put a dent in the battery with flashing mode. It still registered as “fully charged” this evening when I got home. Is this unit worth the price? I’d say it is. The system is competently designed and can fulfill all the basic lighting needs of a bicycle commuter with the additional bonus that you don’t need to leave any hardware on your bike while it sits vulnerable and unattended throughout the work day. It has ample run-time for even the most die-hard long-distance commuters and shines far enough ahead that most average cyclists shouldn’t need to seek supplemental light. I’m giving this one two thumbs up.